Ever since I can remember, I have been a huge fan of roller coasters. Actually, I don’t discriminate. I love all rides, and mostly rides that turn my stomach into knots. I spent numerous summers visiting Wild World (which was about 5 minutes from where I grew up in Maryland, changed to Adventure World and eventually Six Flags) and Hershey Park in Hershey, Pennsylvania. As much as I loved these amusement park trips, there was one drawback–the physical challenge of my short stature. My least favorite memory of this nature took place at good ole Wild World. I was a little daredevil as a child, and wanted to join my mother and neighbors, Terry and Katie, on the Pirate Ship ride which swings a huge boat back and forth like a pendulum. Ride lovers out there will know exactly what I am talking about. Much to my dismay, I did not make the height requirements and had to sit on the side to watch the rest of them have a wildly fun time. As soon as I was able to just barely graze the height line, I was riding every single ride and roller coaster I could! I loved the thrill, the way your stomach goes crazy, and how even though at time I was scared to death during the ride, I was always smiling and happy I rode it when it was over. 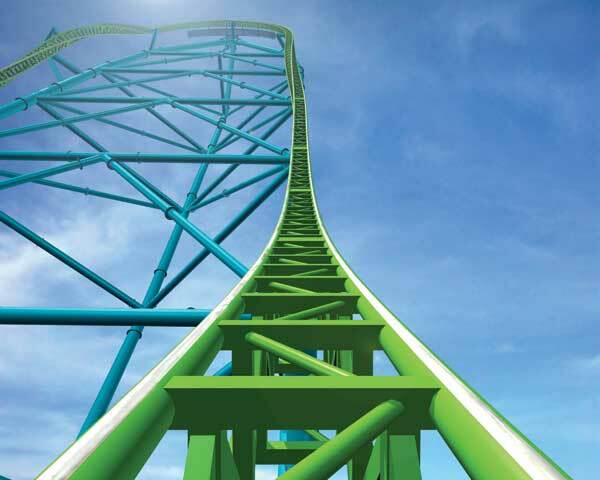 Being the thrill seeker that I am, it was only natural for me to want to ride the tallest roller coaster in the world. I happened to do that this past summer! The best part is that I had no idea I did it until it was already over. I mean, obviously I knew I was riding a roller coaster; I just didn’t realize it was THE roller coaster I had been waiting to ride! My husband, Zack, and I are both adventure seekers, and we had not visited an amusement park in a few years, so we decided to make the trek out to Six Flags Great Adventure in Jackson, New Jersey. We were happy to find that New Jersey Transit provides bus tickets that come in packages with the park tickets. Unfortunately, we found out the the park charges you for an insane amount of things once they have your trapped inside their walls, but that is beside the point. We got to Six Flags bright and early before the gates open, and once we were in, we decided to go to the furthest rides away from the entrance to avoid crowds and wait in shorter lines. We really lucked out the entire day, because there were very few lines, and we were able to maximize our riding experiences. 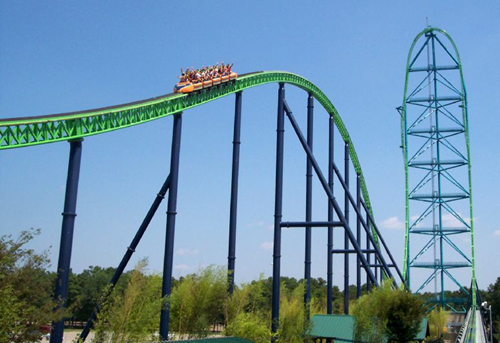 You notice Kingda Ka (the tallest roller coaster in the world) right away when approaching the park because of its height, but at the time I did not know it held the current world record. I didn’t find out until we were leaving the park on the shuttle ride. Zack and I followed up this news by checking every internet source we could to prove it was true. We barely had to wait in line for the ride, strapped ourselves in, did a visual scan (yes Six Flags has their employees do visual scans before each and every ride complete with the hand above the eyebrows), and waited for the blast off that was about to occur. The anticipation was insane as we waited for the inevitable acceleration. When it finally blasted off, it went straight ahead from 0 to 128 miles per hour in 1.4 seconds. Insanity! My stomach was definitely going crazy. If you would have seen my face on the camera, you would have laughed at how scared shitless I looked. 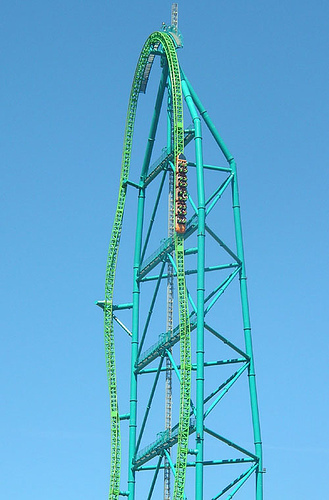 After the blast off, you go straight up into the air with a couple twists, and then right back straight down looking like you are about to spiral to your death. And then the ride is over. Here is a link to the best video I could find that captures the experience!